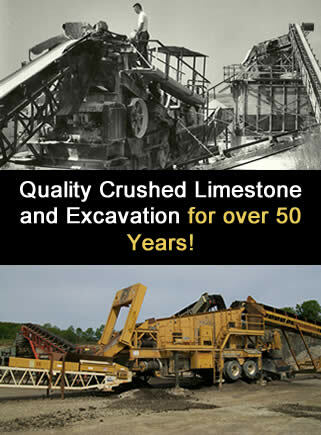 Your #1 Quarry in Southern Wisconsin! Since 1949, Hausz Bros. Inc has been providing quality crushed limestone and excavation. The Hausz family has been mining crushed limestone to service Jefferson County and the surrounding counties aggregate needs since 1949! We are one of the largest crushed stone producers in Southern Wisconsin and strive to produce high quality construction aggregates, while maintaining excellent relationships with our community and the environment. We'll load anything from a 5 gallon pail all the way up to Dump Trucks and Semi Dump Trailers. We also provide excavation services for underground utilities, shoreline work, lot clearing, site prep, subdivisions, and more. Hausz Bros. Inc carries road rock (1/2" up to 3"), screened stone (1/2" up to 3"), light, medium and heavy rip-rap, Bank run blasted rock, screened sand, recycled blacktop and topsoil. Let us help with your next project. We have two convenient locations, Johnson Creek and Fort Atkinson, and a great staff that can help you with any of your needs.